Helping to protect our senior citizens from becoming victims. 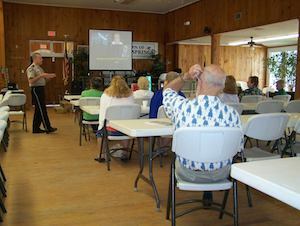 To schedule a senior safety presentation. Avoid parking garages if possible. Don’t park in poorly lit areas of parking lot. Don’t park near alleyways or corners of buildings. Don’t park near shrubs or bushes. Avoid obstructed views from building interior. Don’t park near large vans or trucks. Avoid vehicles with lone occupants. If you encounter a suspicious person, don’t exit your vehicle--leave the area, notify security or law enforcement, and drive to safe area. Know your general location while traveling in your vehicle. Know nearest ‘safe’ place you may drive to. Don’t be afraid to call law enforcement. Before you exit your vehicle, look around! When arriving at home or office, look around. Observe your home and immediate area. Look for broken windows, removed screens, open doors, broken lights. If you observe any of these danger signs, LEAVE IMMEDIATELY! Avoid walking alone. Have a friend or coworker accompany you. Have security accompany you. Keep car keys in hand at all times. They ensure fast entry into your vehicle/office and make a good defensive weapon. 44 million persons age 60+. 36 million people with disabilities. 364,512 cases of people living at home were reported with 43% confirmed. In the last 10 years abuse of elder persons has increases 150+%. Domestic Elder Abuse is a family problem, almost 90% of the abusers were family members. Abuse that occurs in residential facilities for older persons. (e.g. nursing homes, foster homes, group homes, board and care facilities. Abusers are persons who have legal or contractual obligation to provide elder victims with care and protection. (e.g. staff, professionals, paid caregivers). The refusal or failure to fulfill any part of a person’s obligations or duties to an elder. Failure of a person who has fiduciary responsibilities to provide for an elder. Failure to provide an elderly person with necessities, food water, clothing, shelter, personal hygiene, medicine, comfort, personal safety. The desertion of an elderly person by an individual who has assumed the responsibility for providing care to the elder, or by the person who has physical custody of the elder. Bruises, black eyes, welts, lacerations. Laboratory findings of medication overdose. An elder’s report of being hit, slapped kicked or mistreated. An elder’s sudden change in behavior. The caregiver’s refusal to allow visitors to see and elder alone. Bruises around breasts or genital area. Sudden changes in bank account or banking practice. Inclusion of additional names on a bank signature card. Unauthorized banking, remaking of wills, advanced directives, or other legal matters of any kind.